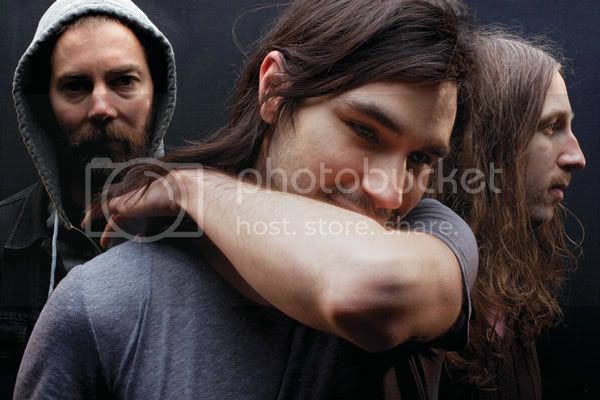 Puresinner - music reviews, previews and news: Russian Circles Releases New Track "Mladek"
Russian Circles Releases New Track "Mladek"
For a track that's based on a supposedly "awesome" European dude, Mladek sounds a little like a punk rock track at the start. But the real awesomeness doesn't really show until the change of pace at the 1.50 minute mark, where the trio reminds fans that they're still the same guys who has created amazing tracks like Carpe (from Enter, 2006) and Harper Lewis (from Station, 2008). Mladek definitely picks up from the 1.50 mark and keeps the off-kilter drumbeats going with the signature looping of Mike Sullivan and the contribution from Brian is still intense as ever with a booming bassline that seems to slide in and out in between guitar riffs. Definitely a must-listen for Russian Circles fans, this track has gotten me really excited for the upcoming album. Empros is set for release on October 25. The full track can be streamed AND downloaded on this link. Photo from MAGNUM MAG. From left: Brian Cook, Dave Turncrantz, Mike Sullivan. Hail Lucifer. Powered by Blogger.